Muda #3 - InventoryEliminate The Muda! Don’t think for a moment that this post has nothing to do with you! Muda or Waste of Inventory impacts virtually everyone at many levels. I won’t bore you with how your expenses are significantly increased by the stores and manufacturers of products you buy due to their waste of inventories. However, I will help you understand how you are wasting your own money and time through the waste of your inventories. 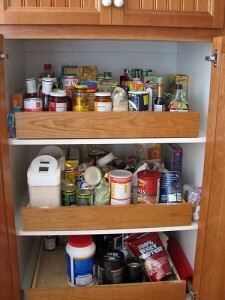 Do you have too much or too little of any products or supplies (inventory) in your house? Too much inventory leads to waste. Most would find this common sense. As an example, last month at the big box store you got excited about a special price on milk, you could buy 4 gallons for only $4. Unfortunately, you have overdosed on milk, you can’t drink another drop and the last gallon goes bad before you can open it. The cost of your $1 gallons of milk just went up to $1.33 ea. for the gallons used! This is waste of inventory, but you can also suffer financially and physically by not having enough inventory. With a memory of your wastefulness last month and current distaste for milk you only purchased 1/2 gallon during your last trip to the grocery store. Then your friends and their children stopped by unexpectedly yesterday and emptied your inventory. Unfortunately, you had promised your kids pancakes this morning and now are faced with the need to make a special trip to the store to keep from breaking your promise. In this case, a lack of inventory caused you greater expense by way of a special trip, extra gas and your time to meet your needs. This is also muda of inventory. With this recognition that we can waste our money, effort and time by waste of inventory (both too much and too little), here is the first technique to help you begin eliminating this form of waste. Consider for a moment what you have in the room you are currently sitting. How many computer programs do you have that you’ve barely used if at all? Do you have any books that have not been read? Are there any supplies that have not been touched? I once read that a University of Arizona study found that the average American tosses 14% of the food that they buy. Think about this for a moment, do you ever dump food in the trash at the end of a meal? Do you find yourself cleaning out old or moldy food when you are putting away the latest batch of groceries? This means that if you could improve your ability to manage your inventory of groceries, conceivably you could reduce your food bills by 14%. How do you reduce your waste of inventory? Make lists – get in the habit of keeping a list of items you need to replenish. If it is not on the list, you don’t need it! Don’t buy – unless you really need the product. Don’t buy just because you have a good coupon, buy only if you are certain to use the product. Don’t cook or prepare more food than necessary. Lastly apply the first technique we suggested in every room of your house. After taking a thorough inventory of your home and considering all the money you could have saved if you had not purchased the things you don’t need and don’t use. Keep these thoughts burned into your memory so that you will be less likely to make the same mistake again. In my usual fashion I have been a bit verbose. A waste of inventory of words? Please comment if you find this interesting or have other thoughts to add!